Heads in Jars - Pickled Garlic - Canning Homemade! My husband and I shop at Costco and joke about how the $300 store keeps coming up with new foods and outrageous stuff to buy. Last week I realized that I needed garlic for a few of my canning recipes. I don't know if you have done this too, but I bought the "bag-o-garlic" at Costco since I would spend that much at the grocery store on just a few heads. I didn't want to let any of it go to waste. A friend of my husband brought over a jar of garlic that he picked up in Gilroy, the garlic capital in northern California. It was pickled, had a smokey taste, and simply delicious right out of the jar. Of course that was my inspiration to put my heads of garlic into a safe place. Cut the ends off first of each clove then blanch for 30 seconds in boiling water. The skins will come right off. 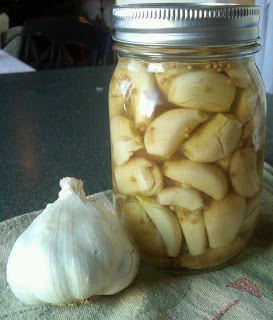 Fill pint or smaller jars with blanched/peeled garlic. Simmer in dutch oven or other non-reactive pot the vinegar, sugar, mustard seed, and celery seed. Cook until the sugar is completely dissolved. Pour vinegar mixture over cloves in jars leaving 1/2" headspace. Use spatula to remove excess air in jar and fill jar again to maintain headspace. Place sterilized lids and rings on jars and tighten. 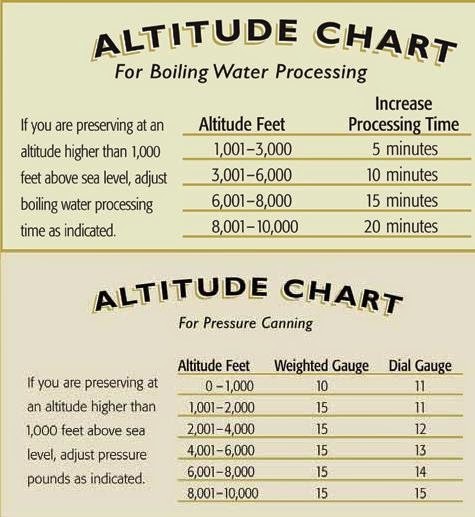 Process in boiling water bath for 20 minutes.